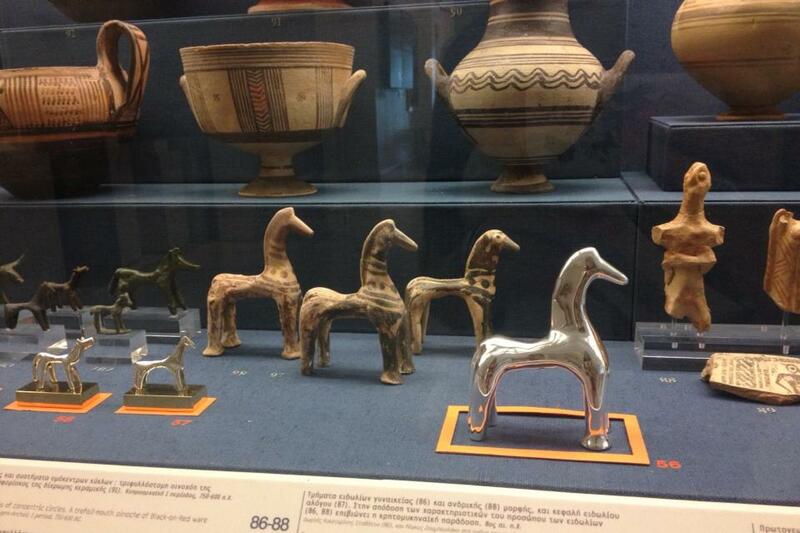 I find myself back in Greece to do research and so, a few days ago, I had the chance to visit a museum in Athens. What struck me as interesting—apart from the narratives that surround all such museum exhibits, that place them in a certain time and frame them in a way that justifies a nation’s origins—was that some artifacts were marked with numbers that corresponded to explanations beside their display case that made no sense. 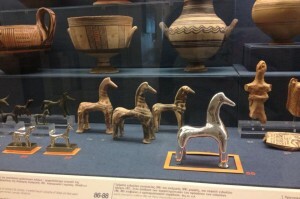 For example, I could see a horse but the explanation talked about a vase that also had the same display number. It took me a while to realize that in the various display cases some of the artifacts were placed in orange frames. Once I realized this I immediately searched for an explanation at the information desk. The lady enthusiastically informed me that these were objects from the gift store of the museum that, celebrating thirty years of its opening, were now included in the displays. My first reaction was that this was absolutely unacceptable. But then I started wondering what prompted this reaction—obviously my sense of fake vs. real, authentic vs. inauthentic, and original vs. replica. Of course the museum had successfully made sure that those distinctions would be evident to the spectators by the use of those orange markers—thereby marking the difference. But at the same time, by integrating the “replicas” with the “originals” the museum effectively reinforced the “nation’s” enduring identity across time by signaling that what was produced a few years ago was also worth being displayed among items made thousands of years ago, thereby effectively linking modern Greece with its ancient heritage. What was different in one way was the same in another. But, come to think of it, those apparently authentic, ancient items from 2000 years ago were “touched,” restored, and put back together again (we’ve all seen what most archeological remains look like when first discovered, no?) by modern Greeks as well, suggesting that, in a way, everything in that display case could be placed within an orange boundary. All of which raises questions for me not only about the way time moves—that is, as a linear line from past to present or, quoting a famous line (for those familiar with the Dr Who series), as a path that instead is “wibbly wobbly, timey wimey“—but also about choices and systems of classification. Kate thanks for sending the story which I have not heard and I’m unaware of the show. What I found interesting about the interview is at 22:00 he talks about a lawyer’s building that he saw in a city that is a replica of the White House and he is implicitly judgemental or some how ironic. Now I know that there are many replicas of the Parthenon in the US and I wonder if they are judged in the same ironic way, if they are not then there are replicas and then there are replicas which makes the replica/authentic binary even more fascinating I think! I agree! I was also intrigued by the humor that was obviously found (actor and interviewer) in the images being presented. Oh, living in Athens, Georgia… we have tons of ‘classical Greek-styled’ homes and buildings. There is a statue of Athena in downtown. I live about 1 hour from Rome, Georgia. It is so odd because while these are obviously not replicas… there is a sense of that they are homages… utilizing the names of classic cities to invoke the majesty of not present day Rome or Athens but a nostalgic creation which exists only in the minds of Georgia’s 18th century elite. Next PostNext Isn’t it Ironic, Don’t You Think?